Installing rooftop solar on your home is a great way to save money, generate clean electricity, and lock in long-term electricity costs. But putting photovoltaic solar panels on a standard home, which may have issues with efficiency, isn’t nearly as effective as designing them into the home from the beginning, where they can be an integral part of an overall low carbon lifestyle. By combining passive solar design, innovative construction methods and materials, a home energy management system with a solar array, and electric vehicle, and intelligent lighting, heating, and cooling systems, Honda is demonstrating how a low carbon, zero net energy home can be built, and the company isn’t stopping at just building a prototype, but is instead offering the plans as an open source smart home design. For the home itself, the passive solar design of the Honda Smart Home aims to reduce cooling costs from the get-go, by keeping the sun out of the home during the summer, and by building with an insulated slab, double stud construction (insulated to R-31), triple-glazed windows, a heat recovery and radiant heating system, a ground source heat pump, and other elements, the Honda Smart Home aims to reduce the energy demands of the occupants. 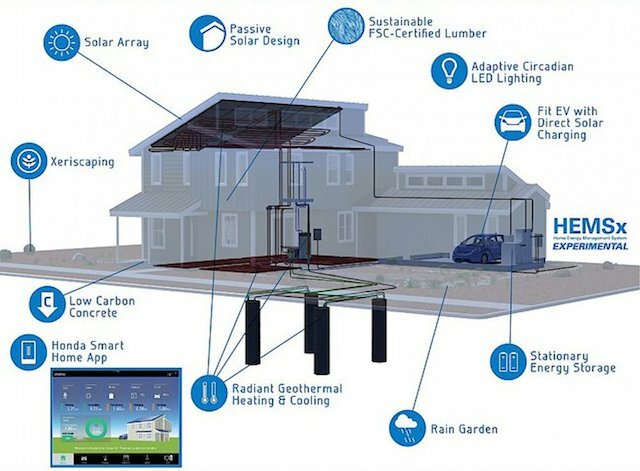 The key component of this smart home, at least in terms of home energy production and use, is the integration of a 9.5 kW solar power array, as well as an energy storage solution (a 10kWh battery array located in the garage), coupled with a home energy management system (HEMS) to handle the details of the system, said to be able to “minimize the home’s impact to the electric grid.” This HEMS is designed with an electric vehicle in mind, which can also help occupants to reduce their energy costs and carbon footprint. These lithium-ion batteries in the home energy storage system could come from used EV batteries, as Honda says they will be evaluating the second life of EV batteries in home-to-grid (H2G) connectivity. Another notable element of the Honda Smart Home is the inclusion of intelligent color-shifting LED lighting, which is said to be healthier for the occupants, while also being five times more energy-efficient than standard lighting. The Honda Smart Home is also designed to use FSC Certified lumber and low-carbon concrete in construction, and to include a xeriscaped landscape in the yard, and a rain garden for maximizing the harvest and use of water. According to Honda, when combined with an electric car, the smart home is capable of reducing the equivalent of 23,500 lb of CO2 per year, when compared to a standard home and car, and is three times more water-efficient than typical American homes. While the Honda Smart Home is just a prototype at this point, those interested in following the company’s lead in building their own home can download the open source plans, including the architectural drawings, the interior design, and the mechanical and plumbing designs, as well as a Sketchup 3D model of the home.